Spiral Wrap Tubing is an expandable spirally cut tubing designed to hold wire bundles firmly yet allows complete flexibility. 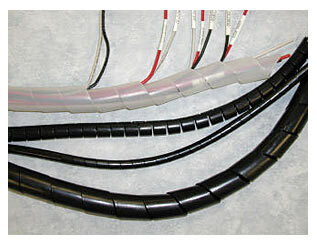 Individual wires can enter or exit at any point on a long harness where many leads may be required. Spiral Wrap allows removal for changes or repair and is easily reinstalled. This material offers more versatility than tape and is quicker to use than lacing tape or cable ties. It is available in a wide variety of materials and colors to satisfy high temperature (up to 260°C), fire resistant (U/L 94V-0 & 94V-2) and U/V applications, plus color coding and identification.